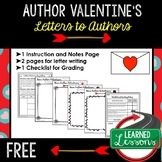 Letters to the Author is an interactive booklet designed to provide your students with writing activities, graphic organizers, and handouts that will teach your students to think outside the box, improve thinking skills, and practice writing. **This is just perfect to add to your TEST PREP library! 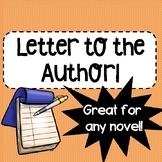 Letter to the Author: Students LOVE to Write a Letter to a Favorite Author! 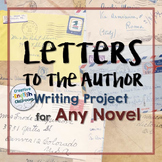 This book report gives students the opportunity to write a letter to an author of their choice. 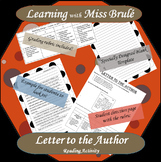 The students are required to read a book then write the author a letter. The directions and rubric are two to a page to save paper. Every year my 2nd graders choose their favorite book and write a letter to the author. It is such a fun activity for everyone. We use this outline as our first step in the writing process. At least half of my class receives a reply from their favorite author! It is so much fun! This file includes student directions and an example for students to follow. This is perfect as a culminating project for independent reading, but it could be used for a class book as well. Enjoy! This is a great resource to use at the end of a novel or after reading a picture book. 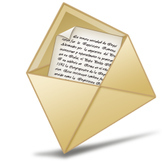 It works well as an alternative assessment or as a formal letter writing assessment. 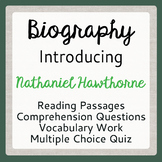 The resource includes student instructions and a teacher rubric. Students are asked to include the following in their letter. A great book report form for the primary grades. 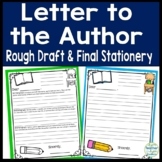 In this format students write a letter to the author. This is an ELD/ESL extension activity for The Circuit and Breaking Through by Francisco Jimenez. This Breaking Through/The Circuit worksheet is a writing task or project for The Circuit or Breaking Through that requires students to take information from the novel and write a letter to the author.